Over the last decade there have been many complaints, including lawsuits detailing allegations of market manipulation, about big US bank holding companies' involvement in the commodities business. Several US statutes, dating as far back as the National Bank Act of 1863 up to and including the Dodd-Frank Act of 2010, generally bar banks from conducting commercial, non-financial activities. But since the US Federal Reserve determined in 2003 that certain commodity activities are "complementary" to financial activities and therefore permissible Wall Street bankers – Morgan Stanley, Goldman Sachs, and JPMorgan are the biggest players – have been moving aggressively into everything to do with physical commodities including mining, processing, transportation, warehousing and trading. A study out in November last year from the University of North Carolina found that banks' physical commodities operations raise "potentially serious public policy concerns" as it is "virtually impossible under the current system of public disclosure and regulatory reporting to understand the true nature and scope of these institutions’ commodity activities." With so much metal already in storage, the warehouses can afford to offer incentives to owners of the metal to store even more, earning additional rent through volume. The LME requires a daily minimum amount of metal to leave the warehouses; it doesn’t specify how much can enter. As supply accumulates, traders can finance the metal, [Robert] Bernstein [attorney with Eaton & Van Winkle LLC in New York] said. Financing typically involves the purchase of metal for nearby delivery and a promise to sell it at a later date to take advantage of a market in contango, where prices rise into the future, Bernstein said. The transactions are made easier by record-low borrowing costs after central banks cut interest rates to boost economic growth. "Users who need the metal can’t get it, and the money they make is coming at the expense of the American consumer," Bernstein said. The supply of aluminum has been particularly distorted according to manufacturers with about $3 billion in additional costs to buyers as premiums have doubled since 2003 despite a glut of aluminum being produced . 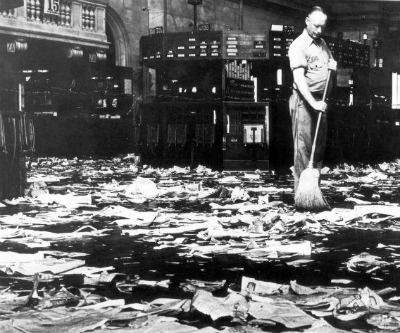 Cleaning up after the 1929 Wall Street crash image by Nationaal Archief.